Our Geami white tissue paper is specially designed as a soft smooth interleaf roll for the Geami WrapPak eco packaging system. The tissue wrapping paper, also available in black, slots on to the dispenser holder along with a roll of white or brown Kraft paper. You then just pull both papers together through the portable manual machine and it converts them to form an effective eco friendly packaging alternative. Choose Geami white tissue paper combined with the outer packing paper casing for an attractive natural presentation that’s strong, professional-looking and reliable. 100% recyclable and biodegradable. 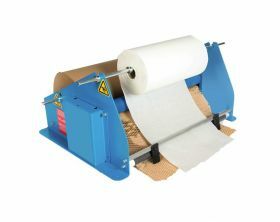 To be used in conjunction with our Geami paper rolls, and the Geami Manual dispenser. Smooth and soft Geami white tissue paper is part of a convenient eco friendly packaging solution that protects goods from scratches and knocks in transit. Offering a professional yet attractive in-the-box presentation. It’s perfect for glass and china, cosmetics and pharmaceuticals, electrical and household goods as well as food and gift packing. This tissue paper is to be used in conjunction with our Geami Manual Dispenser and our Geami Paper Rolls. You will need two rolls of Geami paper (250m, expanding to 420m) to one roll of the tissue paper (840m long). 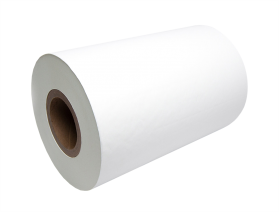 The tissue wrapping paper roll provides scratch-resistant interfleaf when used in conjunction with specially designed white or brown Kraft packing paper rolls in our Geami WrapPak portable dispenser. The outer wrapping is die-cut with thousands of horizontal slits, enabling it to be converted into a robust 3-D honeycomb structure as the two different papers are drawn by hand together through the machine. The resultant shock absorbent protective wrapping paper is easy to mould round items of various shapes and sizes. It can be twisted round spouts and handles or tucked into the tops of glasses. It can be criss-crossed around larger objects, while smaller items like cups can be wrapped singly or bundled together by wrapping and folding along the length of the dispensed papers. The system helps speed up the packing process as you simply tear off the paper from the dispenser as needed and secure your wrapping by simply intertwining the angled cells. You don’t even need scissors or adhesive tape. Why not try make packing fun by giving your packages different looks – chose from the different colour options, for example white out paper with black tissue. Our Geami white tissue paper forms part of an extremely effective eco packaging system that has it all: easy to produce on demand, shock-absorbent, flexible, stylish, 100% recyclable and biodegradable.